Use of the former Columbia State campus and a potential ninth grade academy are all apart of the upgrades to the Franklin High School campus. 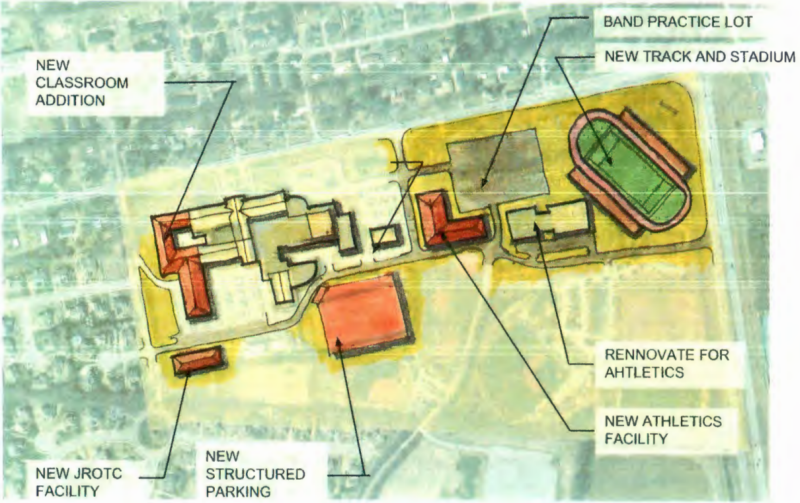 Architectural firm Goodwyn, Mills and Cawood already have four different site plans for the FHS campus, with Superintendent Mike Looney asking they make a few tweaks to some of the concepts before the Williamson school board receives another copy in June. Architects from the firm will come to the June board meeting. The architects noted these concepts and scenarios were intended for owner review and critique. The objective is to obtain owner comments and then refine a concept acceptable to the owner for final recommendation. This plan includes acquiring Columbia State and the Williamson County Animal Control, and it will not impede into residential area or parks. This will increase student population at the existing high school by 400 to 800 students. It would mean adding a two-story classroom addition to Franklin High School by approximately 100,000 square feet. New athletic facilities will include a new eight-lane track and multi-purpose field. Renovations of the Columbia State facility would provide expansion for an athletic complex including locker rooms. A stadium renovation would mean removing the track and reworking the stadium with new locker rooms, toilet facilities and support features. Architects said the concept would provide additional parking and create the band practice field to create new parking. The location of the field will require retaining walls due to site slope. This concept includes acquiring Columbia State and the Williamson County Animal Control, and it will not impede into residential area or parks. The plan would allow for improved site circulation and increase the student population at the existing high school by 400 to 800 students. It will add a two-story classroom to Franklin High School of approximately 100,000 square feet. Architects planned for a new athletic facility, new stadium and track with a renovation to the Columbia State facility for expansion of an athletic complex including locker rooms. The stadium would providing additional parking. The plan calls for the creation of a new band practice field and new parking lot. It would mean adding a new two-story parking garage. This concept includes acquiring Columbia State and the Williamson County Animal Control, and it will not impede into residential area or parks. The plan would allow for improved site circulation and increase the student population at the existing high school by 400 to 800 students. It will add a two-story classroom to Franklin High School of approximately 75,000 square feet. The renovation of Columbia State would go toward creating ninth grade academy classrooms. New athletic facility upgrades would include a new eight lane track and multi-purpose field. The renovation of the Columbia State facility would include an athletic complex with locker rooms. A stadium upgrade would include a renovation, removal of the current track and rework of the facility to include new locker rooms, a toilet facility and support features. It would also provide for additional parking, creation of a band practice field and new parking. The location of the field will require retaining walls due to site slope. This concept includes acquiring Columbia State and the Williamson County Animal Control, and it will not impede into residential area or parks. The plan would allow for improved site circulation and increase the student population at the existing high school by 400 to 800 students. The additional two-story classroom would include 10,000 square feet. The renovation to Columbia State would mean a ninth grade academy and classrooms. Architects included a new stadium and track renovation. The renovation of the Columbia State campus would also include an expansion for the the athletic complex including locker rooms. A new athletics and JRTOC facility would be 50,000 square feet. This concept would also include additional parking with the creation of a band practice area with new parking. Location of field will require retaining walls due to site slope.